Phenomenological states are generally considered sources of intrinsic motivation for autonomous biological agents. In this paper we will address the issue of exploiting these states for robust goal-directed systems. We will provide an analysis of consciousness in terms of a precise definition of how an agent ”understands” the informational flows entering the agent. 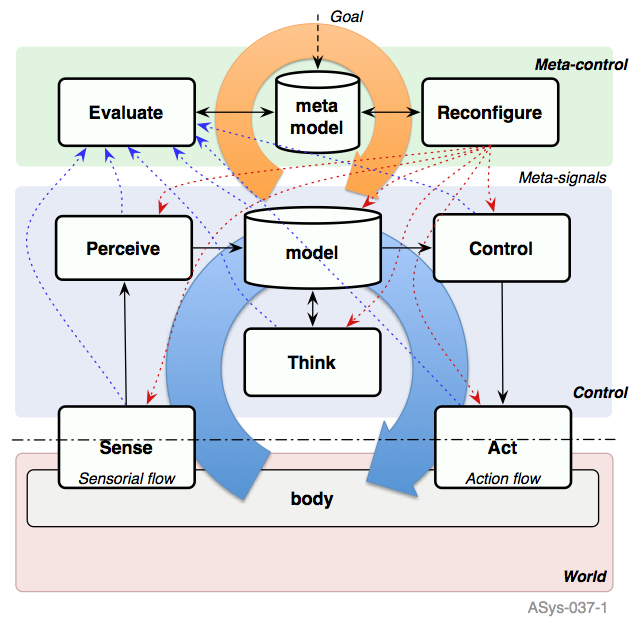 This model of consciousness and understanding is based in the analysis and evaluation of phenomenological states along potential trajectories in the phase space of the agents. This implies that a possible strategy to follow in order to build autonomous but useful systems is to embed them with the particular, ad-hoc phenomenology that captures the requirements that define the system usefulness from a requirements-strict engineering viewpoint. The approach we advocate -the so-called ASys Vision- is based in the definition of a tool-supported engineering process and the production of reusable assets for the construction of bespoke, industrial-grade cognitive systems. A key concept in this vision is the idea of cognitive patterns, i.e. reusable designs for minds. The Epistemic Control Loop is one of those patterns.